You know Halliburton. You’ve probably heard of Bechtel. 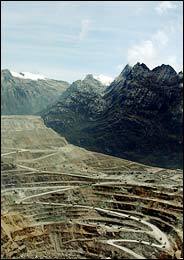 But until today, I’ll bet most of you had never heard of Freeport McMoRan, formerly Freeport Sulphur. Today, the New York Times printed a massive story on Freeport McMoRan, the American-owned New Orleans-based corporation that mines the world’s largest gold reserve. The article charges Freeport with spying on environmental organizers, making large payoffs to individuals in the Indonesian security forces, and polluting groundwater supplies. And that’s just the tip of the iceberg. I’ve written extensively about the sordid history of this company both in Cuba and Indonesia. Freeport ran a huge nickel mining operation at Moa Bay in Cuba when Castro came to power. Castro offered to buy the plant from its owners for the price the owners had valued it on their taxes. Say what you want about his politics, but Castro is a damn smart man. Of course the owners had undervalued their property for years, and couldn’t bear to sell for such a low price when it was worth much more. They refused to sell, so Castro appropriated it. And a VP of the company started talking about Castro assassination plots. In addition, the company ended up providing a link in the chain between David Atlee Phillips, long suspected, with a good amount of evidence, of being Lee Harvey Oswald’s CIA handler, and Clay Shaw, the man New Orleans District Attorney Jim Garrison prosecuted as a conspirator in the assassination of President Kennedy. Do you remember the downing of the “Brothers to the Rescue” plane in 1996? How the Cubans supposedly shot a bunch of innocent Cubans out of the sky over international waters? That was a deliberate provocation led by longtime CIA operative Jose Basulto. Basulto had leafleted Havana just prior to the incident. The Cuban security forces worried that if he could drop leaflets, he could drop bombs, and they weren’t about to give him a second chance. And Basulto was really taunting them. He issued a challenge by radio to the MIG pilots to give to Castro, whom he had already tried to kill before while working for the CIA. He admonished them to “Tell him [Castro] Basulto is coming.” I took Barbara Crosette to task for her inaccurate reporting of this incident in the New York Times and pointed out it was not the first time she had misinformed the public to aid the government. At the time of the incident, Clinton had been threatening to veto the Helms-Burton Act, an act which, among other provisions, enabled American corporations to sue foreign companies over formerly owned properties. The result? Clinton signed the Helms-Burton act into law. Many at home and abroad considered a step in the wrong direction for America. Guess who acted immediately when the act became law? Freeport McMoRan. This was a clear example of how CIA employees run covert operations to benefit the interests of private corporations. There are many more such examples. Freeport turned a lovely mountain, the Grasberg -- called "Copper Mountain" because of its rich copper vein -- into a pit so large it shows on satellite photos. As they mined for copper, they found an incredible bounty of gold. In 1997, the mine produced a million a day in profits. Goodness knows how much it produces now. Political activists put a lot of time into learning about Bush, Rumsfeld, Rove, Cheney. But we should look a little further to see whom these people really serve. Freeport is a much bigger player in international politics than most people know. Board members have included Henry Kissinger and Admiral Arleigh Burke, as well as several prominent members of the Rockefeller clan. I understand that a Frontline special on this company is in the works as well. Heads up. These companies are the real government. Until we understand who they are and what they do, we’ll never be able to control them. And we must control them, before they destroy whole portions of our planet. The Los Angeles Times today presents a story eerily reminiscent of one Sy Hersh wrote just before Christmas many years earlier. Is history repeating itself? If it is, we should look for lessons learned back then and see if those lessons can help us avoid mistakes today. It was extraordinarily difficult to investigate the agencies and the White House back in the seventies, and this at a time when the Democrats controlled the Senate. How much more difficult will it be now, when the Republicans in charge are loathe to investigate their own? President Bush has acknowledged that several hundred targeted Americans were wiretapped without warrants under the National Security Agency's domestic spying program, and now some U.S. officials and outside experts say they suspect that the government is engaged in a far broader U.S. surveillance operation.Although these experts have no specific evidence, they say that the NSA has a vast array of satellites and other high-tech tools that it could be using to eavesdrop on a much larger cross-section of people in the United States without permission from a court. The suspicion is quietly gaining currency among current and former U.S. intelligence officials and among outside experts familiar with how the NSA operates. An extensive investigation by the New York Times has established that intelligence files on at least 10,000 American citizens were maintained by a special unit of the C.I.A. that was reporting directly to Richard Helms, then he Director of Central Intelligence and now the Ambassador to Iran. In addition, the sources said, a check of the C.I.A.’s domestic files ordered last year by Mr. Helms’s successor, James R. Schlesinger, produced evidence of dozens of other illegal activities by members of the C.I. A. inside the United States, beginning in the nineteen-fifties, including break-ins, wiretapping and the surreptitious inspection of mail. What of the President's respective responses when the spying was exposed? When asked by reporters for his response, Ford said he had informed the CIA that he would not tolerate the Agency conducting operations in violation of its charter. Bush, as we know, said just he opposite – not only was breaking the law necessary, but that he had personally authorized it. (Even Nixon was never so bold as to admit he had knowingly broken the law, and he still got impeached. That should give us hope for appropriate action against Bush.) But Ford actually knew of the article days in advance, and had not spoken out at that time, nor had he requested an accounting from the Agency. When Hersh’s allegations hit the wires, Senators and Congressmen called for an investigation, just as Senator Barbara Boxer, Congressman John Conyers, and Senator Arlen Specter did. Arlen Specter, however, has far less credibility on this matter. Specter is the inventor of the Single Bullet Theory in the case of the JFK assassination. The Warren Commission had a serious problem. In order for Oswald to be the lone shooter, he had to get off the maximum number of shots possible in 4.9 seconds. At best, that could only be three. And two of the shots were clearly accounted for. Kennedy has hit by at least one bullet in the head, and a bystander was hit far down the road towards the underpass by a wild bullet. So only one more bullet remained to cause two additional wounds in Kennedy and five in John Connally, seated ahead of Kennedy. The only reason I bring this up is to show that Specter got to be a Senator by lying to protect the government (represented by the Warren Commission). Why should we expect him to be honest now? If he is, great. But I fear he’s eager to grab the investigative reins so he can drive the investigation away from sensitive areas. Ford’s position on the CIA was essentially unchanged as Hersh’s article hit. Ford appointed members to what became known as the Rockefeller Commission, headed by his newly installed Vice President, Nelson Rockefeller. In addition, Rockefeller had been on the President’s Foreign Intelligence Advisory Board which oversaw CIA operations. Many feared Rockefeller would protect the Agency’s operations in order to protect his having approved them. On January 16,  the President had a White House luncheon for Publisher Arthur O. Sulzberger and editors of the New York Times….Toward the end of the conversation, the subject of the Rockefeller commission came up. One editor, noting the predominantly conservative and defense-oriented membership of the commission, asked what credibility it would have. President Ford explained that he needed trustworthy citizens who would not stray from the narrow confines of their mission because they might come upon matters that could damage the national interest and blacken the reputation of every President since Truman. The New York Times, that illustrious “newspaper of record,” kept the President’s confidence then, just as they did more recently for President Bush. But word got out in Washington. After all, there were a lot of people at that luncheon. Because of the commission’s mandate to investigate activities at home, I surmised that he had referred to assassinations in the United States. Similarly, in our time, people from the intelligence community have come forward to expose the CIA’s torture prisons in order to save the Agency’s reputation, not to harm it. By airing the dirty laundry and decrying it, people around the world can be seduced by the appearance of a return to kindler, gentler days. I hope for all our sakes that serious reform will transpire, and real legislative oversight is more possible. And I caution those who pat those doing the exposes on the back. When longtime CIA heavyweight Ray Cline came forward saying that Kissinger and Nixon ordered the CIA to act, against their will, in Chile, Kissinger turned over memos showing that contrary to his public protestations, covertly, Cline was an eager participant. When Ford stumbled so obviously, Congress did not wait long to react, and set up the Senate Select Committee to Study Governmental Operations with Respect to Intelligence Activities, more succinctly known as “the Church Committee” after its chairman, Frank Church. The equivalent body in the House was the House Select Committee on Intelligence, commonly referred to as “the Pike Committee” after its chairman, Otis Pike. The story of these investigations is a hair-raising tale of threats, pressure, and near blackmail. Phil Agee quoted, in an introduction to the Pike Report published in London by Bertrand Russell’s organization, Pike’s comments himself regarding a threat he had heard attributed to the CIA’s Special Counsel for Legal Affairs, Mitchell Rogovin: “Pike will pay for this, you wait and see…We will destroy him for this.” When I heard Senator Gary Hart speak in DC not long ago, Hart too mentioned how unpopular seats on the Church committee were. The head of the Select Committee on Assassinations that grew out of the faint attempt of the Church Committee to address the JFK assassination, G. Robert Blakey, talked at the same event of how he feared for his life the first day he had to drive out to the agency. Investigating intelligence agencies is a difficult and dirty business. The agency holds secrets the President isn’t even cleared to see, as Nixon found out when he demanded to see the CIA’s secret report on the Bay of Pigs incident. Ehrlichman wrote about that in barely disguised fiction in his book Company. So imagine how difficult it is for Senators or Congressmen to pry loose the necessary information? If this committee's recent experience is any test, intelligence agencies that are to be controlled "by Congressional lawmaking are, today, beyond the lawmaker's scrutiny. These secret agencies have interests that inherently conflict with the open accountability of a political body, and there are many tools and tactics to block and deceive conventional Congressional checks. Added to this are the unique attributes of intelligence—notably, “national security,” in its cloak of secrecy and mystery—to intimidate Congress and erode fragile support for sensitive inquiries. Strong words to open a report with! No wonder the Agency wanted this suppressed. But figuring, as Allen Dulles had said to justify the release of the Warren Commission’s evidence, that people don’t read, they were right to leak it. How many of you reading this right now have ever read this before? See? They were right. People don’t read. They don’t read what’s not in the news right now. And history is all important in instructing us on the likely consequences of our behavior. So what did Pike warn future generations regarding how best to investigate intelligence agencies? There were numerous public expressions by intelligence agencies and the Executive that full cooperation would be accorded. The credibility of such assurances was important, since almost all the necessary materials were classified and controlled by the executive branch. Despite these public representations, in practice most document access was preceded by lengthy negotiations. Almost without exception, these negotiations yielded something less than complete or timely access. The Committee refused, as a matter of policy, to sign agreements. It refused to allow intelligence officials to read and review our investigators’ notes, and avoided canned briefings in favor of primary source material. The Committee maintained that Congress has a right to all information short of direct communications with the President. Nonetheless, if that is the positive side, it was offset by the extraordinary efforts that were required, even in a climate favorable to reviewing past Executive conduct, to identify and obtain documents. It is a commentary in itself that subpoenas were necessary. It is a further commentary that much of the time subpoenas were not enough, and only a determined threat of contempt proceedings brought grudging results. So will we get to the bottom of the torture prison scandal? Will we find out how many Americans were spied on and why? Or will we, like Pike, end up pulling out our hair in frustration at the difficulty of investigation a government wedded to conducting policy through covert activities? Guess what? WE determine the answer to that question. It’s up to us to hold our representatives’ feet to the fire, and to watch their backs when they step up and do the right thing. Pike and Church succeeded as well as they did because the public was vocally, persistently urging them on. Our current representatives need no less. I recently heard George Clooney speak here in Los Angeles after a special screening of Good Night and Good Luck. He felt the subject of McCarthyism couldn't be more relevant to our times, when the word patriotism is being twisted to mean supporting the presidency and his administration. Clooney said he already knew what failure felt like, and wasn't afraid of it. This was something he was passionate about, as were all the others who eventually joined the project. They worked for peanuts, kept the sets contained to meet the low budget, made black and white look glamorous rather than cheap, and turned out a film sure to garner a slew of Academy Award nominations. Clooney told us how hard it was to get funding for the film, but how now, the movie has repaid its investment three times over. When a film like that is successful, it paves the way for others, a good sign as we flounder in dark seas and need the illumination of art on our politics as much as ever. Clooney is also currently visibile in Syriana, the truest fictional story I've ever seen about how the world really works, and how our actions have consequences far beyond what we imagine, something a country as young as America (200 years is nothing compared to several thousand in most other places on earth) has trouble understanding. Clooney talked about out how the sixties and seventies were filled with really meaty political films. He didn't roll off a list, but I think immediately of The Manchurian Candidate, Three Days of the Condor, The Parallax View, and similar others. Films that told us true facts disguised as fiction. But what was going on in America at that time? The Vietnam war. Watergate. The Church Committee Hearings. The House Select Committee on Assassinations. The more we learned, the more artists felt the need to communicate their understanding of these events in a way that would reach people on the emotional level. We're at a parallel point in time. We have the Iraq war. Plamegate. The Fitzgerald inquiry into same. And there is growing talk of impeachment hearings over the NSA spying on Americans scandal. I've always been fascinated by the choices writers make when writing. Wicked is the backstory to the Wizard of Oz. Why is the witch green? Was she born wicked, or was wickedness thrust upon her? Why is the Lion cowardly? And how come the Lion can speak, but not the flying monkeys? These questions, their answers, and more of the same await the lucky ones who see this show. As Richard Zoglin wrote in his review when it first opened, "If every musical had a brain, a heart, and the courage of Wicked, Broadway would truly be a magical place." More interesting to me was the fact that the musical Wicked is as overtly political as the book, if not moreso. I was shocked and pleased at how bold the writers were, how it felt like the script had been written a week before, rather than six years earlier. I caught my breath several times, fearing Anne Coulter would come running in to seal the theater, having found all the traitors at last in one place! How deliberate were those choices? Very, as it turns out. Today, a friend gave me a gift that helped me peer into these very deliberate choices: Wicked: The Grimmerie, a book about the origins of the musical and the book on which it was loosely based. I feel compelled to share some of the comments of those involved in bringing the production to life. I first got the notion for Wicked in 1988…then in 1990, I moved to London…when the first Gulf War started. I found myself riveted by how the British press vilified Saddam Hussein to galvanize public opinion in support of the military action against Iraq. I mean, I agreed that Saddam Hussein was a villain, but my politics were less important than my noticing how the British press used certain words to draw attention to the need for military intervention. I came back from London…and found that, without my quite having noticed it, my politics had shifted way to the right. And I took myself to task for it: “Wait a minute. You’re a progressive liberal. How did this happen? How did you lose your moorings so quickly?” That’s when I realized that I could marry these concerns to questions I had when I first thought of the idea of Wicked: Was it possible for someone to change his moral stripe? To be born blameless and become evil? Or does one have kind of a kernel of evil inside, like cells that are predisposed to be cancerous? …the Wizard’s character evolved in terms of what we were seeing around us. When we started writing Wicked in early 1998, the Bill Clinton scandal had just broken out. Everyone was reeling with the absurdity and horribleness of what we’d all been through with that scandal. And we ended up talking about the Wizard a little bit like Clinton, somebody who had these weaknesses. Then, while we were developing the script, George W. Bush took power. And the Wizard changed. He became more dangerous. We were just responding to what was going on around us. I mean, in the middle of writing, New York City was attacked on September 11…. Gregory’s book…parallels events and political situations that we know of on earth, both current and from the more overtly fascist days. We were very aware of them when we wrote…[but] we made it more about American politics. Depending on what color state you live in, you have a view of how close to fascism we are right now. (producer Marc Platt:) …the Wizard has no power. He has to exploit the fear and ignorance of others. That is a theme in history that repeats itself over and over. How many times have we seen leaders or dictators who prey on the differences in others in order to galvanize a group of people? It happens all the time in history, repeatedly. That resonates. If there's any one good thing to come out of the last five years, it is that artists are waking up, speaking out, and making extraordinarily eloquent and elegant statements about the nature of empire, the interconnectedness of us all, and the need to be good to each other in a truly meaningful, not shallow, way. Tis the season. Reach out. Do something. Do some good thing. And watch how your actions ripple out and cause consequences far beyond your imaginings. I was present when Dean said "impeachable offense"
Talk about a witness to history. A few years from now, I feel confident I'll look back and say, I was present at the turning point that led ultimately to Bush's impeachment. I was excited to see Boxer because although I've followed her for years, I've never seen her in person. She's fantastic. Passionate. And the most articulate person on the subject of abortion and why a woman's right to choose should not be considered a "liberal" or "Democratic" issue but indeed a bill of rights issue. When challenged about her opposition to a move to make women notify their husbands in writing in advance of getting an abortion, she turned that back on the males pressuring her, and said, do you think you should have to notify your wife before getting a vasectomy? Not one man said yes. He opened by joking that usually he was the one answering questions from Senators, not asking them. He asked Boxer to describe her book, and she described it as a political page-turner. From the excerpts she read, I was less impressed with her writing abilities than at the way she was throwing light on how government really operates. On that basis alone I think it will be an interesting read. Just about everything Boxer said brought a YES out of me. "Secrecy is unAmerican." YES! "The truth is a commodity not well respected by this administration." YES!! Regarding the Democratic party's lethargy in addressing the Iraq war and the administration's wrongdoings, "We have awakened." YES!!! Dean and Boxer talked briefly about how, especially in comparison to Bush, Nixon could almost be called an environment president. Boxer said something about how some of the best environmental legislation was signed in by Nixon. If he were campaigning today, Dean said, Nixon could run as a Green. "Well, I wouldn't go THAT far," laughed Boxer. And then, almost from out of the blue, as the talk moved to the spying on Americans, Dean blurted out how Bush was "the first president to ever confess to an impeachable offense." I sat there stunned, for a moment. Then I wrote it in my notes. But was it true? It seemed like too rich candy, a too expensive toy - something to desire but not actually have. So imagine my joy this morning to see that Boxer had been quickfooted, had contacted four presidential scholars, and had concluded from them that Dean was right. This IS an impeachable offense. Wow! That wasn't the end of the talk, however. That comment came early on. There were other notable comments. Re the Republicans who voted in support of torture, Dean decried, "May it haunt them forever." When justifying the title of his last book, "Worse than Watergate", Dean succinctly stated, "No one died as a result of Watergate." That was succinct, but perhaps not entirely accurate. E. Howard Hunt's wife was killed in a plane crash that many feel was deliberately sabotaged. But it was the title of Dean's next book that sent shivers through me. I couldn't believe he would dare. His next book is "Conservatives Without Conscience." Wow. That really sums up the current administration and Congressional leaders. Hearing the words "admitted to an impeachable offense" was perhaps the sweetest of birthday gifts I received Sunday. Sharing that experience with a friend was a close runner up. I sent the following to Mother Jones and thought I would share it here as well. And oops - forgot to add the link when I first posted this. This is in reference to this article in Mother Jones' Nov/Dec 2005 issue. I find Mark Hertsgaard’s article on whether the Ohio election was stolen as flawed as the reports he criticizes. He starts by setting up a straw man in the case of Sherole Eaton’s use of the term “cheat sheet.” It never mattered what actual words were used to describe the sheet. Clearly, a sheet was ordered prepared to ensure the counts matched. That’s simply wrong. The point of an audit is not to ensure a match, but to look for discrepancies. Computers can be programmed easily to report any count desired. There is no other way to view the purpose of the sheet as anything other than a “cheat sheet.” By focusing on the terminology and not the act, Hertsgaard dismisses irresponsibly one of the events most in need of explanation. He sets up straw man number two by claiming that since four people were allowed to watch the counting of the votes in Miami County, the vote was not counted in “secret.“ This is linguistic slight of hand. To me, a vote that no one outside the incumbent political system can see is “secret” enough to warrant the label. The real issue is: why wasn’t the reporter allowed to watch? Shouldn’t our elections be transparent, especially to the press? Amazingly, Hertsgaard doesn’t blink when he explains that votes were changed from Kerry votes to Bush votes because of a computer glitch. Not to worry, Hertsgaard assures us. The problem was caught, and fixed. How can Hertsgaard dare claim by implication that all problems were caught? How many weren’t noticed that might have affected the outcome? Herstgaard asserts confidence where confidence cannot possibly be warranted as demonstrated by the computer glitch in the first place. Here’s an analogy. We caught Bush in one lie. He admitted it. Hurray! Bush only told one lie and we caught it, therefore government is honest. That’s the same illogic Hertsgaard employed. Hertsgaard really overreaches when he comes to the Exit Polls. He again sets up a straw man – taking his argument re exit polls to New Hampshire, where only a handful of people suspected fraud. He doesn’t mention New Mexico, for example, where straight Green Party votes were provably not apportioned to the party’s candidates. This was apparent when some precincts showed that votes had been cast for the Green Party slate, yet Green Party candidates on those same tickets received 0 votes. There was no way to know if votes for the Democratic slate met the same fate because the number of votes for Democratic candidates was higher than the number of slate votes. In addition, Hertsgaard quotes only Mitofsky Edison (M/E) on their polls, and ignores their critics, like the statisticians at USCountVotes.org. That’s a bit like asking Rove if he leaked Valerie Plame’s identity to reporters. Maybe he did, and maybe he didn’t, but if he did, do we really think he’d just tell us? To believe the M/E explanation, we’d have to believe people lied about their votes for President, but told the truth about every other race on the ballot, because amazingly, the polls were incredibly accurate in all races except the one for President. In addition, people had to always lie in the same direction. How come Kerry voters didn’t lie and say they voted for Bush? Statistically and logically, when all the errors always fall in the same direction, there is no randomness. Randomness suggests error. Nonrandomness suggests corruption. And why was it that the people only lied about their vote in battleground states? The same M/E polling procedures and methods used in the battleground states were used in every state of the nation. But they were only off in battleground states. The final argument Hertsgaard makes is the saddest, most illogical of all, but certainly not a unique one: “even if Kerry had won Ohio, the national vote went to Bush by three million votes.” The only reason we know about all the fraud in Ohio is because we have a Bob Fitrakis there, a John Conyers there, a Stephanie Tubbs-Jones there, who have fought tooth and nail to find out what happened in their state. If we had someone looking into the vote in the same depth in New Mexico, in Colorado, in Pennsylvania (which Kerry won, but by so much smaller a margin than expected as to raise the specter of attempted, but unsuccessful fraud, which would have added to Bush’s overall numbers) and of course, the mother of all fraudulent voting procedures, Florida. If the vote could be gamed, there’s no reason to believe the corruption would be limited to Ohio. It only takes changing a few votes in a few thousand counties to change 3 million votes and more. I don’t know who won the election in 2004. I don’t think we should consider Bush the winner simply because we haven’t proven the opposite case. In a court of law, in a sentence, and in Boolean logic, the maxim is, false in part, false in whole. Since our election was provably false in part, the only logical, legal response should have been to consider the whole election invalid. Bush won, alright. Not because he got the most votes, but because Kerry didn’t challenge the count. Had Kerry challenged, Bush may still have won. Or not. We have no way to know who got the most votes because we never counted all the votes on paper in the open. And I’m no longer willing to simply accept any assurances from public officials regarding our votes on faith. Nor from reporters, for that matter.